KULIK SYSTEM ERGONOMIC CHAIRS - WORLD WIDE PATENTED. 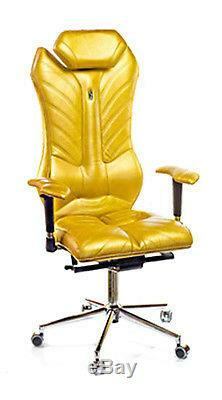 Monarch Real Leather Hand Finished Gold Executive Chair. KULIK Luxury Italian Made Ergonomic Office Chairs with Handmade Finish. Comes in a Extensive range of Colours and Finishes-Can Add Own Logo-Can Add Swarvoski Crystals. Monarch Armchair by Kulik Systems. Monarch armchair is an absolute power of comfort and design, unconditional credo for those who are accustomed to win. Victorian style inherent in this model creates a an impeccable style of the aristocrats. (The Gold Chair on offer is Real Leather but can also be produced in Eco Leather at a reduced cost). Upholstery natural leather, color gold Individual Designer Stitching Aristo Base chrome Ergonomic headrest Backrest and seat inclination adjustment Swinging backrest Armrest Adjustment Padded armrests Seat height adjustment Backrest vertical adjustment Seat horizontal adjustment (slider) Gummed wheels Load bearing 130 g. Chairs of Kulik System guarantee a complete rest to the spine. The design of chairs repeats the natural anatomical contours of your body, corrects the posture, prevents the occurrence and progression of spine diseases and ensures health and comfort. It is the synthesis of elegant comforts and prophylactic relaxation. The Italian company Kulik System is a multi-level enterprise with powerful intellectual base and high-tech manufacturing, whose operations have been perfectly streamlined and manufacturing process, is automated. By developing a general scheme, the company's specialists have provided all of the possible options for interaction with clients and partners, establishing the credo of Kulik System, a recognized leader in its field. One of the most important areas is the clinics of Kulik System, where the main concepts of this system were created to support, correct and reduce the burden from all the areas of spine. The practicing doctors-vertebrologists and rehabilitation specialists working from their personal experience and in constant contact with technologists of the company, test and improve the system, making it invulnerable defender of the spine and the body as a whole. Engineering bureau of Kulik System - is a gifted team of talented engineers who are researching and inventing the unique possibilities for the progress of the company. For this reason, it is considered the intellectual center of the enterprise. The rate of successful business process is directly related to the applied technologies and equipments. In addition to the application of unique hand finishing technology, the elite sewing equipment is used in the ergonomic armchairs factory of Kulik System. Molding of flexible polyurethane foam is done on Italian-made equipment. We have Just Become One Of Kuliks Official Uk Distributors. We Are baised In The North West and customers Are welcome to view The Kulik Chairs In-Store. The item "Ergonomic Business Gold Leather Office Chair Italian Hand Finished Patented" is in sale since Monday, October 31, 2016. This item is in the category "Business, Office & Industrial\Office Equipment & Supplies\Office Furniture\Office Chairs". The seller is "sdf_manchester" and is located in manchester, Lancashire. This item can be shipped worldwide.